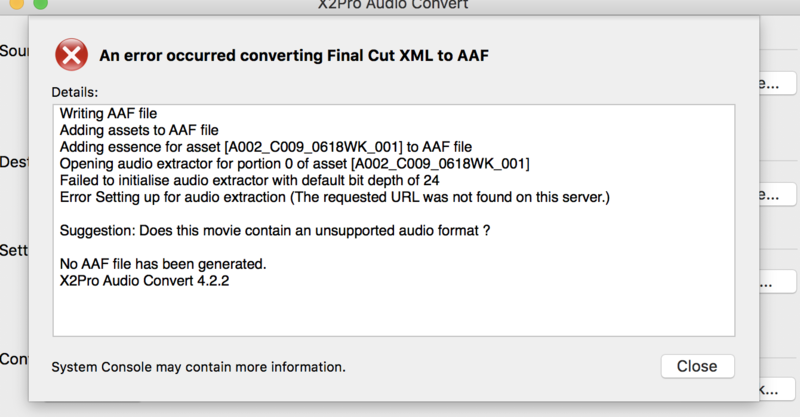 X2Pro is struggling to find the asset "A002_C009_0618WK_001". Can you confirm that X2Pro has access to where it is located? Adding the filepath to it in the media locations tab in preferences might help. If not, would you be able to send us the XML for us to investigate further? All drives are connected and I linked them all. And the FCPX project file originated on my iMac. FCPXML being processed on a different machine to the FCP edit. If you need additional help identifying the problem please post the FCPXML and any error information from the console which relates to this application. Hello - I keep getting this error, even when I try 16bit (see pic). Please advise. Thanks! !